4th and forty eight. Never forget. Earlier today, Angelique S. Chengelis, Michigan beat writer for the The Detroit News gave her rundown and prediction for each Michigan opponent coming up this fall. We here are Maize & Blue Nation have a ton of respect for Angelique, so I was slightly taken back by her 10-2 regular season prognostication. Not because I think she's crazy wrong, but rather as someone who's covered Michigan Football for as long as she has, giving this team a 10-2 prediction is worth noting. Her two losses are likely ones – Michigan State and Ohio State, both of which battled for the Big Ten title last December. Any discussion about this season's contenders is sure to involve both of those two. But Michigan's schedule, albeit a rather lousy home slate, is actually pretty tame. Winnable games abound, especially at home. And as it's been the case since Brady Hoke arrived three years ago, Michigan's fate will lie in its ability to win on the road. Let's give it a go, shall we? This ain't going to go down like it did 7 years ago (...please college football Gods). That Appy State team was unstoppable in the FCS…winning 3 titles in a row. They were the Alabama of the football championship subdivision. This Appy State team is a far cry from that. And while I still contend that there's zero upside to playing a game like this, Michigan rolls. Everett Golson is back for the Irish as QB after a year on academic probation. If Brady Hoke and Michigan are going to kick their road woes, this is a great place to do it. The final Michigan-Notre Dame matchup for the foreseeable future should be a classic battle. Its gonna be a real shame to see this series die. I foresee Notre Dame winning in a squeaker. The Redhawks were 0-12 last year. Michigan gets back into winning record territory with a comfortable win while cutting the MAC a giant check. Seriously though, how funny would it be if they actually had to pay them with a giant novelty check at midfield after the game. A photo op and everything. I'm on board. Kyle Whittingham has a who's who of coaches on his staff -- Dave Christensen, the ex-Wyoming coach, is the new offensive coordinator; Dennis Erickson, the ex-Miami and Arizona State coach, is running backs coach; and ex-Purdue standout and NFL veteran Taylor Stubblefield is coaching receivers. She likes Michigan here and so do I.
Michigan handled Minnesota last year in maybe the most comfortable win of an otherwise miserable 2013 season. But the Gophers played the remainder of their schedule better than expected. For the first time in 40 years, equipment manager Jon Falk won't be on the sidelines to present the victorious Wolverines the Little Brown Jug. But he'll enjoy the win nonetheless. Michigan wins, but probably not a comfy 42-13 like last year. Michigan hits he road again for another primetime matchup. This time, it's New Jersey to welcome Rutgers to the Big Ten. Many starters return from last year's 6-7 Scarlet Knight squad, which may or not be a good thing. Michigan gets its first road win of the year. Michigan's first B1G night game should deliver a good game. Michigan has much to play for now that the Nittany Lions are in Michigan's division, plus they'll want to avenge last year's 4-overtime heartbreaker. Penn State has a bounty of playmakers which could cause problems much like it did a year ago. But Michigan in the Big House at night? Come on. Michigan wins. Two straight trips to East Lansing is not exactly what the doctor ordered for Michigan this year and last year, but its just a scheduling reality. Either way, this game is has been circled on Michigan's calendar since last year's 29-6 pummeling. I agree with Angelique that this year's game will be closer. But I disagree on the outcome. 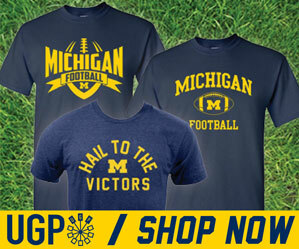 I think Michigan shocks the world, and pulls off the upset over an overconfident Michigan State team. Brady Hoke gets his first marquee road victory in a very big way. Riding high after bringing Paul Bunyan back to Ann Arbor, Michigan welcomes one-dimensional Indiana to the Big House. The Hoosiers can score points, as we saw last year, but they can' stop anyone. They do have a new defensive coordinator, but it'll take time to bring the B1G's worst defense back from the brink. Michigan wins. As well as going to East Lansing two years in a row, Michigan also travels to Evanston again in 2014. This will be a tougher and closer game than Michigan fans would like…much like last year. But a smarter, more focused and disciplined Michigan squad gets the win. No idea how this game will play out. I like head coach Randy Edsall and I think he could make Maryland into a contender in this league, but not in year 1. A one-loss Michigan squad playing at home with everything to lose will probably be ready for this game. Boy oh boy…here we go again. I highly doubt OSU is undefeated going into this game, but certainly 1 loss isn't out of the question. Odds are, if my prediction holds true and Michigan is sitting at 10-1, this one could be for all the east division marbles. But Braxton and the Buckeyes at home are tough to go against. I'm probably absolutely crazy for doing this, but I'm predicting a Michigan win. Hoke sheds his "can't win on the road" image and send the Wolverines to the Big Ten title game. 11-1? Angelique picked 10-2 and I considered that looney. Am I insane? Did I see what happened last year…was I paying any attention? Allow me to sorta justify. First off, it is possible to go from a dismal 7-6 to 11-1 in just one season (See: Michigan State 2012-->2013). Second, I have an enormous amount of faith in Nussmeier and his ability to put Michigan's offense on the right track. If Michigan's O can produce results (i.e. run the ball/control the game), they can take those winnable losses from last year and actually, you know, win them. Its possible. That's all I'm saying. Its highly contingent on Michigan getting its offensive line house in order, but its possible. Its possible. Its also May 1st, so we have some time to figure this out.